Gas prices continue to shock as large cities hit almost $5.30 a gallon. Though an ideal solution may be to sell or donate your car and bask in the physical and financial benefits of cycle commuting- our guess is that tanks continue the need to be filled. 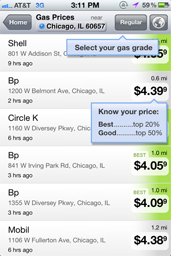 Though we cannot offer solace in news of a time machine to take us back to the days of $0.99 gallons, in the meantime here are four noteworthy apps to help you find the cheapest gas prices in your area. Launched in 2004 as initially only a website and only available in Minneapolis, GasBuddy is now one of the most popular gas search apps available. It relies mainly on its users for updates by offering a weekly incentive of winning a $250.00 gas card and other prizes. GasBuddy covers every major metro area in the United States as well as Canada. It allows you to search by price or distance, and can use a map view to sort as well. When you click an icon, it also directs you to the option to map out directions from your current location with your phone’s GPS function. It is one of the most thoroughly developed apps, probably since it has been around for years with its original www.GasBuddy.com website launch. It includes all the functions that you would need and is very user friendly. Similar to GasBuddy, you are able to search by both price and distance. Also like GasBuddy, it relies on users to update the prices. You can do a manual search or use the application’s GPS function to locate your location and find nearby stations. You are also able to display all grade prices. Although you have most of the functionality as its predecessor GasBuddy, it is missing the map view, which ends up being a useful feature. I also knocked off a grade for being less universal than the GasBuddy app since it is only available to Apple customers. This app includes all of the bells and whistles of the others (ability to search by fuel grade, distance, price, a map function) plus more. With Fuel Finder you get an estimated drive time to the gas station, customized savings calculation based on your cars MPG, tank size, and average miles per year. There is even an “On Fumes” mode that finds the closest stations possible for those emergency situations where you can’t even spare to turn on the heat (we’ve all been there!). Another addition is the additional information the app supplies on stations’ services such as car wash, food mart, ATM, etc. We like the added features, especially the ability to see which services each station supplies- but it definitely lost a grade point for its cost. 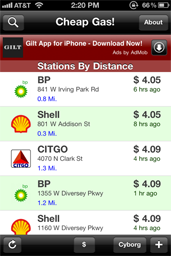 Though $2.99 most likely won’t break the bank- it doesn’t offer that much more than its free competitor GasBuddy. 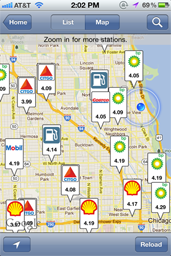 This gas finder blends with the rest of the Yellow Page services to allow you to find not just gas prices near you, but restaurants, movie theatres, banks, etc. You can find local businesses, read reviews, and check gas prices all in one place. Besides being a great tool that allows an easy-to-use guide to the city, the interface is also very attractive. The gas prices are color coded based on price. Green indicates the cheapest prices while yellow indicates competitive pricing. This is a great app not just for its gas locating services, but also for navigating the city. If you don’t see any plans for car donation in your near future, any of these aps will help you save a lot of money at the gas station. We hope you have great day and good luck at the pump!